Yesterday I awoke at 3:22 AM to prepare for dowsing energy on Sacred Land some 2 hours away from where I live. 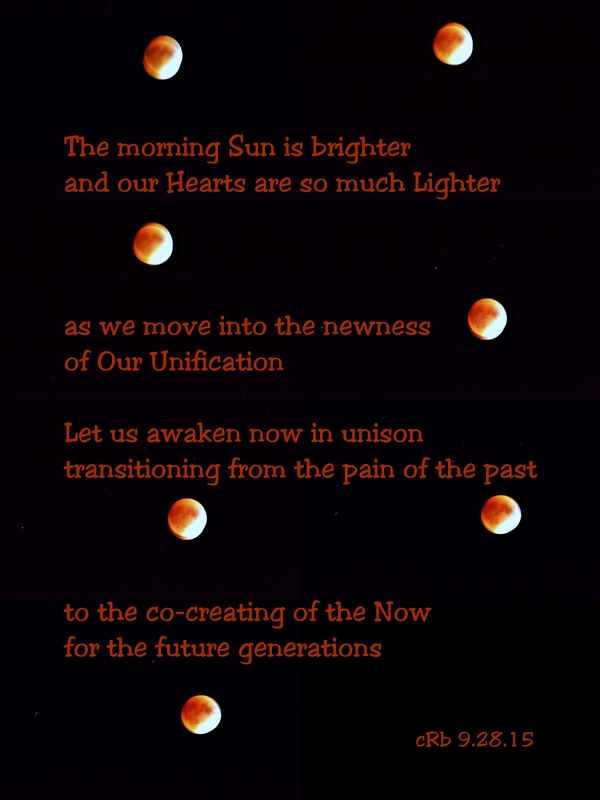 The fact that it was to be done on the day of the Full Harvest Moon Eclipse was predetermined in our willingness to co-create a unified field of harmony and balance for all who will share their hearts on that land. So preparation began with tuning in to the land and creating a Despacho prayer bundle to be given in gratefulness to Pachamama (Mother Earth) and the Elemental Spirits for their continued Love and support. The Dowsing and Energy Clearing done, Hearts aligned We discussed how each of us are Divine Energy expressing itself here on Earth. We each felt that this Eclipse represents for us a major turning point for all humanity, a coming together of great healing. Driving home was filled with several stops to rest, as my energy had been completely emptied. Poured out to fertilize and assist in a new beginning for all of humanity. There is such a great feeling in exhaustion when it is in alignment with something greater than yourself, that can’t be readily explained. Yet, I know many of you will understand this. When it came time for the actual Eclipse I didn’t even want to photograph it as I was too exhausted and in a semi-conscious state from the day’s activities. Yet here I was some 19 hours into my day and being called, once again, to awaken again and be present for this moment. To absorb through my physical presence and vision this amazing energy as the refilling of what I had given so freely during the day. So without tripod and half awake I clicked and went to bed. On arising and with my first cup of coffee in process, the words you see imprinted on this collage of shots poured forth from the fingertips as I saw how much everything appeared changed. And even if nothing else had really changed I certainly had and it was tangible. Yes WE ARE each a Living Expression of that which we call the Divine Mind. Let’s join at the Heart now and embrace each other in the Truth of that understanding. Co-Creating from Our Highest State of Conscious Awareness in Harmony and Balance with All who dwell here and seek to come in what we call the future. Peace, Light, Love and Many Blessings to each of you as WE journey together.